According to the United States Citizenship and Immigration Services (USCIS) failure to comply with any eligibility requirement for naturalization is subject to revocation of naturalization. Most recently, the Department of Justice (DOJ) filed civil denaturalization complaints against Baljinder Singh of New Jersey, Parvez Manzoor Khan of Florida, and Rashid Mahmood of Connecticut under Operation Janus. In January 2018, Baljinder Singh of New Jersey, whose fingerprints were missing from the centralized digital fingerprint repository, was denaturalized by the USCIS. According to the Immigrant Legal Resource Center (ILRC), “United States citizenship is not absolute—it may be “lost” in either of two ways: 1) Any citizen, by birth or naturalization, may choose to abandon it voluntarily; or 2) if acquired through naturalization, the government may revoke citizenship if they can prove a person obtained citizenship illegally. Expatriation is the voluntary abandonment of citizenship, while denaturalization is the revocation of naturalization and citizenship by the government. government may revoke citizenship if the individual illegally procured or procured citizenship by ‘concealment of a material fact or by willful misrepresentation.’ Once citizenship is lost, the person reverts back to their pre-naturalization status. This resource, co-created by the ACLU and Immigrant Legal Resource Center (ILRC), discusses the Trump administration’s denaturalization operation and describes the process of denaturalization, who the targets are and the number of cases as well as the historical context for these efforts. This practice advisory, created by the ILRC briefly describes these recent efforts to increase denaturalizations, the legal grounds and process for denaturalizing a citizen, and the consequences of denaturalization. Washington, D.C., Today South Asian Americans Leading Together (SAALT) released its 2018 Midterm Election Voter Guide, the only resource designed to engage, educate, and mobilize the growing South Asian American electorate in Congressional districts nationwide. At over 5 million strong, South Asian Americans are the second-most rapidly growing demographic group nationwide, across longstanding community strongholds and newer regions in the South. As a result, South Asian Americans occupy an increasingly significant position in the American electorate. 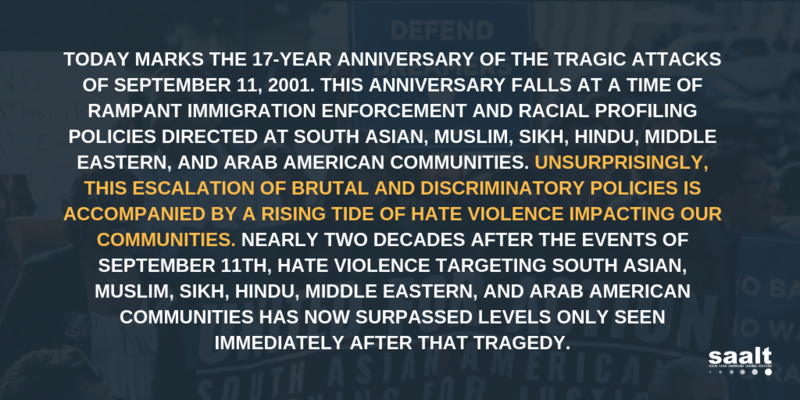 In this critical election year, South Asian Americans have a stake in key policy questions that affect our communities, and are deeply impacted by issues spanning immigration, civil rights, hate crimes, and the 2020 Census. The Guide is a voter education tool that equips South Asian Americans and all voters with the crucial information they need to cast informed votes this November. SAALT’s non-partisan 2018 Midterm Election Voter Guide does not endorse any candidate—rather; it analyzes House of Representatives candidates’ positions on four critical issues for South Asian Americans in twenty Congressional Districts with the highest South Asian American populations. The Guide also includes analysis on two additional races that feature a South Asian American candidate and a Congressional district whose Member currently holds a leadership position in the House of Representatives. Each race shows the Democratic and Republican candidate positions on the issues of immigration, civil rights, hate crimes, and the 2020 Census based upon their responses to a series of questions. SAALT reached out to all candidates with a questionnaire and analyzed publicly available information on their voting records on federal legislation, public statements, and policy platforms to develop our analysis. For all incumbent candidates, SAALT analyzed only their voting record on key legislation to determine their policy positions. All questions are included in the Guide to allow voters to assess a candidate’s positions themselves even if a particular Congressional district is not featured. 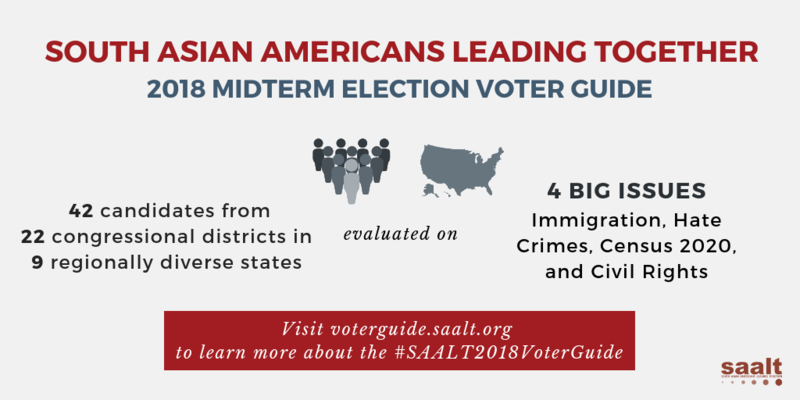 SAALT will be distributing its 2018 Midterm Election Voter Guide far and wide in partnership with its 62 community partners in the National Coalition of South Asian Organizations (NCSO), national allies, as well as over social and traditional media. The Voter Guide will be unveiled in-person at this weekend’s The Future of South Asians in the U.S. regional town hall in Niles, Illinois in partnership with Chicagoland NCSO organizations. On Saturday, October 6th from 1-4 pm, this powerful and topical forum will address the impact of U.S. immigration policy on the South Asian American community. The Voter Guide will continue to serve as a critical community education tool that keeps the focus on the important issues impacting our nation on the road to the November 2018 elections and beyond.